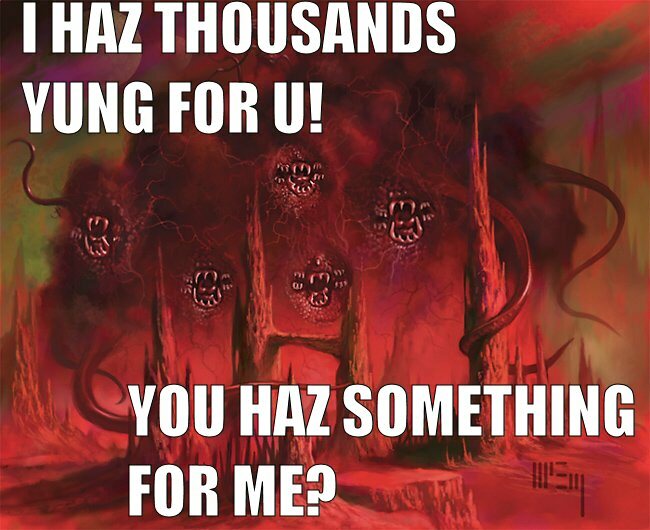 LOLTHULHU » I HAS THOUSANDS YUNG FOR U! YOU HAZ SOMETHING FOR ME? I HAS THOUSANDS YUNG FOR U! YOU HAZ SOMETHING FOR ME? 4 Responses to I HAS THOUSANDS YUNG FOR U! YOU HAZ SOMETHING FOR ME? Shub-niggurath sounds just like an IT department. I has invitation to Girls’ Night! I’m the earthly avatar of Tiamat, the goddess of salt water and Chaos; and Ammut, Devouress of the Dead; Tefnut, the Warrior; Chantico the Fire Bringer; and Coyolxauhqui the Destroyer will be there too. We can eat chocolate and knit and do our hair/fur/feelers/other cranial protrusions and talk about boys/men/gods/earthly love slaves/green men/males. It’ll be soooo much fun!